A rash of lawsuits have popped up over Tropicana Orange Juices claims that they make a ‘natural’ and ‘100% pure’ product when the drink is actually full of chemically engineered ‘flavor packets’ and other unnatural ingredients. 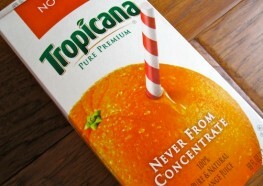 Tropicana Brand is made by Pepsi-Co, a company that fought GMO labeling and also just settled out of court to the tune of $9 million for its false advertising claims on its ‘Naked’ juice products. ‘Flavor packets’ might seem unneeded since fresh squeezed orange juice is already quite delicious and flavorful, but these chemical constituents are added to reconstituted juice that may have been sitting around in vats for a year or more. Just some of the chemicals in these ‘flavor packets’ are terpene compounds such as valencine. Terpenes occur naturally, and are sourced from lots of plant types including the conifer tree. However, once they have been chemically altered they become terpenoids and are used to remove paint from brushes, as in turpentine, the caustic artist’s medium. Furthermore, because this OJ could sit around for months, juice companies hire flavor and fragrance experts to chemically alter the final product to make it palatable in much the same way Givenchy and Christian Dior make their perfumes smell ‘sweet.’ The juice is reconstituted, hardly the 100% fresh, healthy juice straight from an organic orange, let alone a conventionally grown one that is full of pesticide residue. In the Lynch vs. Tropicana lawsuit, plaintiffs are suing for “unjust enrichment; breach of express warranty; numerous violations of New York, New Jersey and Wisconsin laws; punitive damages; injunctive relief and declaratory relief, among other complaints.” If these 7 individuals are able to successfully win their case, manufacturers might be a little more mindful about the claims they make about our foods, especially as the public is becoming more alert due to GMO-labeling being refused by the politicians we voted into office, and the widespread blatant label lies of the food industry. If you feel you have a right to know what is in your food, you can visit JustLabelIt.org to become more active in fighting for healthy, natural food in just eight easy steps. I think that this is the exact tactic that farmers should use against Monsanto. Monsanto said that their GMOs were going to increase the yield of their crops…it did not. They said that the GMOs would kill the roundworms…it did not, instead it made them stronger and resistant to the Round-up. They said that it was safe for the environment…it is not. They said that would feed the world, it does not. Instead, most of the world rejects GMOs now. They said it would control the weeds…it does not, instead it makes them more resistant and, once mowed down, farmers must use special Kevlar tires to mow it again because the stumps are so strong. They said it could be contained…it can not. False advertising…All of it! Monsanto lies about their GMOs in every way possible and yet, they still contend that their products are the greatest thing since sliced bread. NOT IN MY BOOK! Farmers Unite and sue Monsanto for false advertising! Damn, in my 20's I was drinking screwdrivers like there was no tomorrow. I gave up vodka thinking it was bad for my liver; I guess I ought to have given up orange juice instead. Who knew that the vodka is healthier than the juice in a screwdriver? I find it very frightening how GMO foods have invaded our food system. It is now to the point that everything you eat should be questioned. As you can tell I am an advocate for natural foods. The problem is, natural really has no meaning, as such any longer. The toxins found in some GMO foods are so bad bugs won't even. eat it! Why should we be any different? When we change the very structure of the things we eat how can we benefit? It seems like the intent is only to produce more food. But at what cost is this to everyone who eats these foods? Look around at todays people and you will find a society filled with disease. Are your foods safe? Thank You Randy Schmuki Here was their response! We appreciate your interest in Tropicana and the fruit that we use to make Tropicana juices and beverages. The fruit we use has not been developed through biotechnology. All of our products, worldwide, comply with national food laws and labeling regulations. Tropicana relies on and supports the regulatory agencies charged with safeguarding our food supply when sourcing ingredients for our products. We're committed to using only safe and approved ingredients in our products. I hope this information is helpful to you, Randy, and that you'll select and enjoy Tropicana. Their juice does not sound safe to me , as they told me it was! Why am I ticked off? Just for that reason.